Mapping of Mars at 100 meter (328 feet) per pixel resolution by the Thermal Emission Imaging System (THEMIS) on Mars Odyssey shows many more channels than known previously. Some of the channels show a branching (dendritic) pattern that suggests they formed by water flowing over the surface. Several of these channel systems, located in the Echus and Melas Chasma regions, are highly developed and integrated, suggesting the water flowed for geologically long periods of time. If water flowed over the surface, possible sources include atmospheric precipitation in the form of snow or rainfall. Geological evidence leads scientists to give the Echus and Melas Chasma channel systems an age of Late Hesperian, which means they formed about 2.9 to 3.5 billion years ago. Scientists have assumed that only the oldest era in martian history, the Noachian, had an atmosphere thick enough to allow surface water. Because the Noachian ended around 3.6 billion years ago, the channels found by THEMIS suggest either a thick atmosphere continued longer than scientists previously thought, or that wet periods occurred intermittently afterward. Mangold, N., C. Quantin, V. Ansan, C. Delacourt, and P. Allemand, Evidence for Precipitation on Mars from Dendritic Valleys in the Valles Marineris Area, Science, 305, 78-81, 2004. 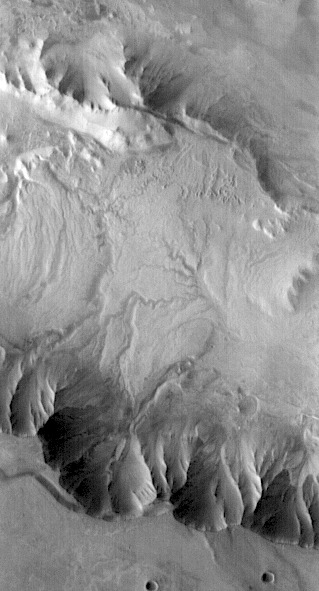 Part of THEMIS daytime infrared image I06631017 shows branching channel systems developed on the floor of Melas Chasma within Valles Marineris. The image is 32 kilometers (20 miles) wide and centered near 9.5° south latitude and 283° east longitude. Part of THEMIS visible image V03249001 shows details of the Melas channel systems. 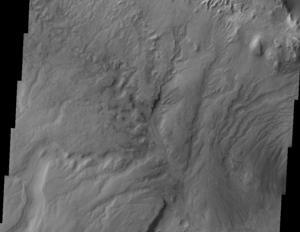 The image is about 19 km (12 miles) wide. A portion of THEMIS nighttime infrared image I02119003 shows dendritic fluvial channels on the mesa west of Echus Chasma. The image is 32 km (20 miles) wide and centered near 0.5° south latitude and 279° east longitude. 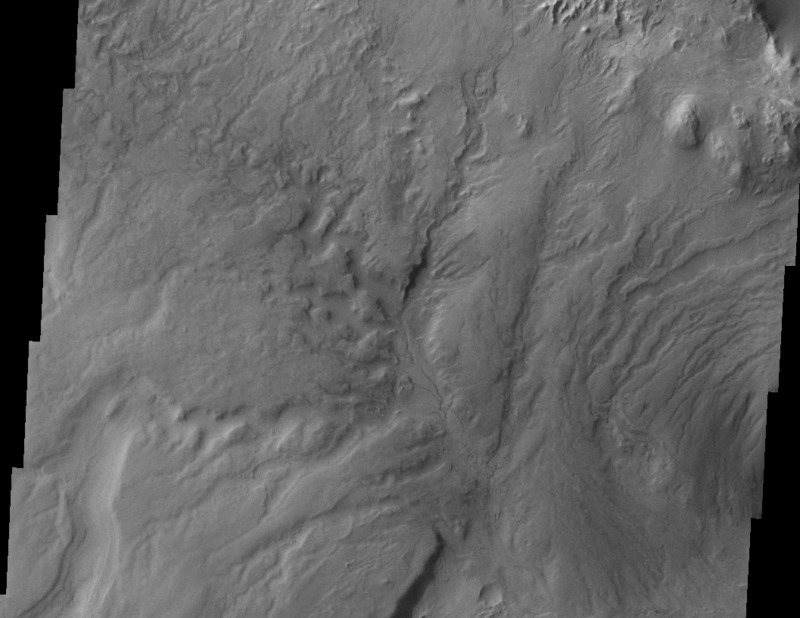 A portion of THEMIS daytime infrared image I01950002 reveals two channel patterns on the mesa surface west of Echus Chasma. The large, stubby canyons formed as water or ice escaped from the ground, undermining the surface and causing collapse. In between them lies a faint pattern of shallower branching channels that were likely carved by water running across the surface.